I did promise you two posts this week….and so here is the second. Being an old stone cottage, my house is always freezing cold, unless there’s a fire burning in the grate or the wood burner is lit. But as Toby has thieving tendencies when it comes to things in the fire grate when it’s cold, I daren’t trust him to be in the same room when it’s lit; so either I’m cold with company, warm and alone, or I compromise my comfort and sit on a floor cushion in the dining room where the stove and Toby’s pen are. For the record? The latter happens far more than it should for any sane human being. So pleased with them, I decided they were also just the thing for my friend Julie, who suffers from Cold Mouse Hand (a common affliction in our office) so whipped up a pair for her. One for on, and one for the wash, as my grandmother used to say. They’re an easy quick knit and while they do feature my hated slip stitching, it does add a bit of pretty. 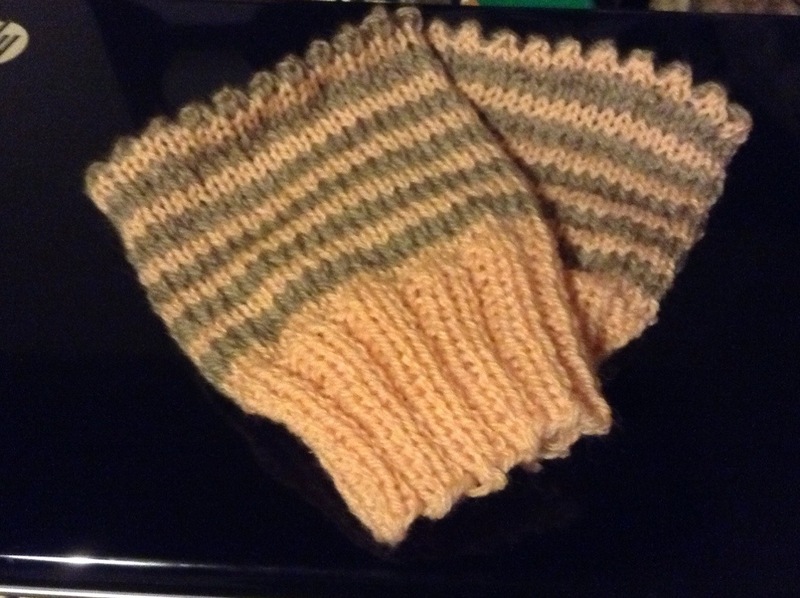 If anyone wants my version of the pattern just holler – I can type it up now that my hands are warm! This entry was posted in knitting, life and tagged fingerless gloves, friends, knitting.